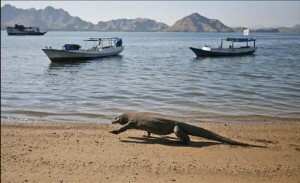 USA Today reports on a series of komodo dragon attacks in Indonesia. Something new to Fear Beneath! Komodo dragons have shark-like teeth and poisonous venom that can kill a person within hours of a bite. Yet villagers who have lived for generations alongside the world’s largest lizard were not afraid — until the dragons started to attack. The stories spread quickly across this smattering of tropical islands in southeastern Indonesia, the only place the endangered reptiles can still be found in the wild: Two people were killed since 2007 — a young boy and a fisherman — and others were badly wounded after being charged unprovoked. … Main, a 46-year-old park ranger, was doing paperwork when a dragon slithered up the stairs of his wooden hut in Komodo National Park and went for his ankles dangling beneath the desk. When the ranger tried to pry open the beast’s powerful jaws, it locked its teeth into his hand. Filed Under: Animal Attacks, News, South Pacific Tagged With: komodo dragon attacks, komodo dragons attacking village, komodo dragons or great white sharks? who is more vicious?